How his ideological journey will shape the war. One afternoon in October, a blue and white jumbo jet flew high above the Pacific Ocean, approaching the international dateline. On board was the secretary of defense, Robert Gates, who was on an around-the-world trip that would end with a summit of NATO defense ministers, where the topic of the day would be Afghanistan. Gates was flying on what is often called “the Doomsday Plane,” a specially outfitted 747 that looks like a bulkier Air Force One and was built to wage retaliatory nuclear war from the skies. Its hull contains metal wiring to shield its avionics from the electromagnetic pulse emitted by nuclear explosions, and a super-reflective coat of paint renders it what the military calls “thermal radiation protected.” Officially known as the National Airborne Operations Center, the $223 million jet is the brainchild of former Defense Secretary Robert McNamara, who feared that the Soviet Union could decapitate U.S. leadership with a surprise attack, and it bristles with communications equipment that can instruct American bomber pilots, ICBM crews, and submarine commanders to fulfill the compact of mutual assured destruction. Today, the Doomsday Plane feels like a cold war anachronism. And, until recently, so did Robert Gates. For most of a CIA career that began under Lyndon Johnson, Gates had what he calls “a consuming goal”: defending the United States from the Soviet Union, which he still refers to as the “Evil Empire,” echoing the words of his onetime boss, Ronald Reagan. Some of Barack Obama’s top aides knew that era only as children. But it shaped a Washington national security establishment that is still struggling to adjust to a chaotic world of terrorism and counterinsurgency. No one straddles these contrasting periods more visibly than Gates, who today finds himself fixated not on Soviet missile silos but on Al Qaeda hideouts in Afghanistan and Pakistan. Even so, the past echoes: Gates was present as the cold war’s end gave birth to modern Afghanistan. He helped oversee CIA funding for the Afghan mujahedin, who drove out the Soviets, and the aid cutoff that began a cascade of chaos and violence that culminated in the September 11 attacks. “I think you need to have a highly developed sense of irony,” Gates told me in an interview aboard the Doomsday Plane. “Because twenty or twenty-five years ago, I was shoving arms across the border to Gulbuddin Hekmatyar,” a former mujahedin leader turned anti-American warlord. What’s also ironic is the extent of Gates’s influence over Obama’s Afghanistan strategy deliberations. Perhaps no Cabinet member matches Gates’s impact in the Situation Room as the White House reviews its war plan. It may be Washington’s oddest partnership: a secretive white Republican intelligence insider in his sixties, and a charismatic young African American Democratic president who was barely 30 when the Soviet Union fell. Asked about the contrast, Gates flashes a wry smile: “I think about it all the time,” he says. In recent weeks, the contrast has verged on something like tension. The day Gates departed Washington on his plane, White House chief of staff Rahm Emanuel had suggested that a decision about General Stanley McChrystal’s request for more troops might wait until after a November 7 runoff election in Afghanistan. To his displeasure, Gates had learned about this new spin in the papers. He also was not impressed by the substance of it: “We’re not just going to sit on our hands, waiting for the outcome of this election and for the emergence of a government in Kabul,” Gates told reporters en route from Honolulu to Tokyo, where he was due to meet with his Japanese counterpart. His reedy Kansan voice barely cut through the engines’ dull roar. For a veteran of so many foreign policy crises, Gates seems oddly shy--he tends to avoid eye contact while speaking, looking to the side or into the middle distance. While Afghanistan’s fraud-ridden elections had “complicated the situation,” Gates continued, “the reality is, it’s not going to be simple, it’s not going to be complicated one day and simple the next.” Government legitimacy in Afghanistan would take time, he said, and “the president will have to make his decisions in the context of that evolutionary process.” Translation: We can’t wait for perfect conditions, Rahm. Let’s get on with it. The episode was a reminder that, while the admiration between Gates and the Obama White House may be mutual, it may not be unconditional. Gates has so far won lavish praise for his management of the Pentagon. “Based on where we are today, I’d say he’s the best defense secretary I’ve seen in a long time,” says Andrew Krepinevich, a military analyst who serves on the Pentagon’s Defense Policy Board. But the easy part is probably behind him. The past several months have demonstrated that Obama may be wary of a major long-term U.S. commitment in Afghanistan. Gates, by contrast, seems convinced that Taliban gains would be a strategic disaster. And other important policy differences lie on the horizon. Gates’s service to Obama has made him one of Washington’s most revered figures and completed a years-long rehabilitation of his once-controversial public image. The question now is how long it can last. “I don’t think he’s gonna say a troop number.” It was Wednesday, and Gates was in Tokyo, at the modern Ministry of Defense headquarters. As he met with his Japanese counterpart to discuss U.S. military bases in Japan, Gates’s traveling press schemed out questions for a post-meeting press conference. “I think he’s made up his mind,” another scribe replied to the first. A decision was made to aim low and ask Gates whether he had reached a decision, leaving the specifics to another day. Gates appeared at a podium, solemn-faced next to the Japanese minister. “Have you come to a decision in your own mind about the best way forward?” a reporter asked. But the question had been posed in two parts, and Gates answered only the first, unrelated question. It would be one of several futile attempts by the Pentagon reporters on the trip to get Gates to say that he had reached a decision. That fervor came back to bite him in 1987, when his ties to the Iran-Contra scandal sank his first nomination to head the CIA. No one publicly alleged that Gates, then the CIA’s deputy, had been directly involved in orchestrating the scheme to sell arms to Iran in exchange for hostages and then use the profits to fund Nicaragua’s Contra rebels. But there was evidence that Gates had been aware of the deal and had done nothing to stop or expose it. The independent Tower Commission found that the Reagan NSC had manipulated a CIA assessment of Iran to help provide the policy rationale for selling the country arms. Several Senators held Gates responsible, including Bill Bradley, who said that Gates had been aware that “the CIA tailored its intelligence assessment on Iran to fit the needs of the policymakers of the White House.” Seeing that he had little to no hope of confirmation, Gates withdrew from consideration. As the cold war wound down in the late 1980s, Gates was also strikingly slow to appreciate the import of Mikhail Gorbachev and his campaign of perestroika. “He radiated a skepticism about Gorbachev that was so intense that his bureaucratic foes sometimes thought it contained a barely disguised nostalgia for the bygone era when Soviet leaders had glowered, stonewalled, bullied, and otherwise behaved according to stereotype,” write Michael R. Beschloss and Strobe Talbott in At the Highest Levels, an account of the cold war’s end. “He was very skeptical that Gorbachev could actually change the Soviet Union, and warned that Gorbachev might be succeeded not by another Gorbachev but by another Stalin,” adds James Goldgeier, a George Washington University professor and Soviet expert. So strong was Gates’s skepticism of Soviet liberalization that he was willing to roil the foreign policy bureaucracy to express it, in ways that would make the circumspect Gates of 2009 blanch. In an October 1988 speech, for instance, Gates pronounced it “doubtful that Gorbachev can in the end rejuvenate the [Soviet] system”--adding that “Stalin would be proud” of Gorbachev’s manipulation of the Politburo. The speech contradicted the prevailing Reagan administration position, leading then--Secretary of State George Shultz to scold Gates for trying to make policy outside proper channels. Undaunted, Gates planned a similar address the following year, when he was deputy national security advisor under George H.W. Bush. This time he was stymied. When a draft of his speech reached the office of Shultz’s successor, James Baker, his deputy (Dennis Ross--now a senior member of the Obama NSC) warned Baker that the speech was “ridiculous” and would undercut the administration’s position. “I agreed,” Baker later wrote in his memoir, and he prevented Gates from giving the speech. The Berlin Wall fell the following month. Forgiving such missteps--Gates was still considered a sharp thinker and an even sharper manager--Bush nominated him to lead the CIA in 1991, but Gates’s confirmation process was once again contentious. Critics within the agency charged that, as deputy CIA director, Gates had slanted agency reports about the Soviet Union to please his superiors--particularly Casey, his staunchly anti-Soviet boss. According to one Soviet analyst, Gates had “corrupt[ed] the process and the ethics of intelligence.” Shultz himself later made this case, writing in his memoir that he confronted Gates in 1987 to complain that the CIA, where Gates was the number-two man, had allowed “policy views” to infect its analysis, and tried to “manipulate” him by cherry-picking intelligence. Gates vehemently denied this line of criticism with a meticulous point-by-point defense that helped to save his nomination. But some thoughtful Democrats, including Bradley and Daniel Patrick Moynihan, were never convinced, perhaps agreeing with the tart assessment from the liberal columnist Mary McGrory that Gates had acted as “the perfect butler” for hard-line higher-ups. Soon after he left government at the end of the first Bush presidency in 1993, Gates returned to the question of politicized intelligence. When the Gingrich Republicans took power after the 1994 elections, a group of audacious young House conservatives, eager for the United States to deploy a national missile-defense system, accused the Clinton White House of manipulating intelligence reports in order to downplay the danger of ballistic missiles from rogue states like Iran and North Korea. To drive the issue, House leaders created a special commission to study the threat. Perhaps considering him a hard-line ally, they put Gates in charge. 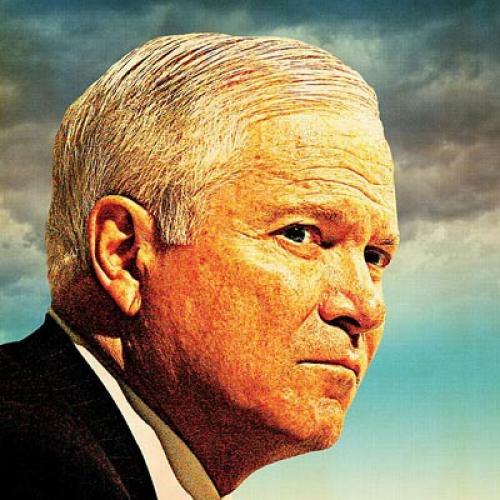 In the Obama administration’s long-running debate over Afghanistan strategy, Robert Gates may hold the most important swing vote. On one side are people like Joe Biden and Obama’s political advisers, who warn that a major troop commitment could lead to a strategically and politically disastrous quagmire. On the other side are the military men whom Gates oversees, like McChrystal and Joint Chiefs of Staff Chairman Michael Mullen, who has publicly called for a major troop commitment. Obama appears frozen between the two camps. But the president puts immense stock in his defense secretary’s advice, and White House officials have made clear their desire that Gates stay in his job for the foreseeable future. On one hand, Gates has no love for Washington--two brutal sets of confirmation hearings will do that to a man. He is wry about the city’s absurd rituals and often jokes about White House aides who jockey their way into photos with the president and grown men crying because they were denied seats on Air Force One. After he left government at the end of the first Bush administration, Gates hit the lecture and corporate board circuit and bought a house in Washington state--about as far from the District as he could get. But along with Gates’s disdain for Washington comes a deep weakness for it. His memoir is unabashed about the narcotic effect of knowing an explosive national security secret before it makes the news. “However many times I experienced this sequence,” he wrote, “it never lost the edge, the excitement of being a part of history. It is one of the great natural highs.” Thus, when George W. Bush, who knew of Gates through his father, called him back into government in late 2006, the allure was hard to resist. Sure, Gates was happy as the president of Texas A&M University, where he won accolades from faculty and students alike for bringing on new talent and boosting the school’s reputation. And, yes, Bush did have to ask twice: Gates turned down an early 2005 offer to become Director of National Intelligence. (“I had nothing to look forward to in D.C. and plenty to look forward to at A&M,” he later said.) But that changed after Republicans were routed in the 2006 midterm elections and Bush finally sacked the obstreperous Rumsfeld. When Bush appointed Gates, it seemed a potential sign that the president was ready to wind down the Iraq war. Gates had, after all, served on the Iraq Study Group (ISG), whose blockbuster December report endorsed a major troop drawdown from the country. But, by the time the ISG report was issued, Bush was already considering his Hail Mary play of surging more troops into the country. And Gates, apparently, was onboard from the start. He sent an e-mail to the commission’s chairmen, James Baker and Lee Hamilton, recommending an additional 30,000 to 40,000 troops for Iraq. Gates, in other words, was privately recommending more troops than Bush wound up committing. In public, however, Gates was cryptic about his views, and many key players had little idea where the new defense secretary stood. “The pro-surge wing was always worried, ‘How committed is Secretary Gates to the surge?’” says Peter Feaver, who worked on Iraq policy for the Bush National Security Council. “It wasn’t clear to me how he felt about it,” echoes retired Army General Jack Keane, who some consider the surge’s chief architect. “He played a very similar role” during the Iraq debate to the one he plays now, says Stephen Biddle, a defense policy analyst at the Council on Foreign Relations. Biddle says Gates may simply still be forming an opinion. But, he adds, “the other possibility is that being the uncommitted swing vote is a pretty influential position to be in. You can imagine that, just as a matter of bureaucratic practice, he would avoid trying to stake out a position on this early and, instead, end up being the arbiter.” In other words, a position that would give him the “private exercise of influence” on which he thrives. In April of last year, a reporter asked Gates whether he might consider staying in his job under a new president. “The circumstances under which I would do that are inconceivable to me,” he replied. But managing two wars is a hard thing to walk away from. So, apparently, were the entreaties of a wildly popular new president. Barack Obama began thinking about Gates as a holdover soon after he won the Democratic nomination, at the behest of Democratic Senator Jack Reed of Rhode Island, an Army veteran who had developed a kinship with the defense secretary. (Reed would serve as “the emissary between Gates and Obama,” according to Pentagon spokesman Geoff Morrell.) Keeping on Gates, it was clear, would offer political cover to a Democratic president lacking military credentials who proposed to withdraw from Iraq. Other key Democrats, including Nancy Pelosi and Harry Reid, supported the decision. They admired Gates’s forthright and apolitical demeanor--as when he was asked at his December 2006 Senate confirmation whether the United States was winning in Iraq and he replied, “No, sir.” Rumsfeld this was not. Like Rumsfeld, however, Gates is a shrewd operator--a “bureaucratic black belt,” in the words of former under secretary of defense Eric Edelman. In the first months of the Obama administration, he kept a light travel schedule so that he could bond with the new White House team. There was a rough patch early on, though: During the transition, the Obama team arranged for Gates to meet with Richard Danzig, the former secretary of the Navy. Danzig had been a top Obama campaign adviser, and many people had expected him to become secretary of defense. After Obama tapped Gates instead, Danzig was in line to become his deputy at the Pentagon. By many accounts, the meeting did not go well. Even if it had, multiple sources say, Gates would never accept a deputy who was closer than he is to the president, especially one sure to be seen as a successor-in-waiting. “There’s no way he could afford to have Danzig there,” says a former Bush administration official who worked with Gates. “Everyone would start venue-shopping” when promoting their policy positions. This spring, Gates applied that killer instinct to the toughest bureaucratic foe of all: the military-industrial complex. Shifting the Pentagon’s spending priorities is a legendarily daunting task. But Gates was convinced that, in a time of tight budgets and new threats, military spending was disproportionately skewed toward expensive high-tech defense systems designed for improbable contingencies like war with China. Thus, he was determined to craft a Pentagon budget that spends far more preparing for the sort of counterinsurgency operations that the military has been conducting in Iraq and Afghanistan. But such talk couldn’t derail Gates’s budget plan, which Congress passed largely intact. And that, say Pentagon observers, is quite a feat. “The toughest place to make significant change in the Department of Defense is with its future,” says Keane, who served as the Army’s vice chief of staff. “He fundamentally changed the direction of the Army, forced them to institutionalize irregular warfare and changed the Army’s entire modernization program. That is astounding.” Gates, the cold warrior, had reshaped a Pentagon machine rooted in cold war thinking. On October 22, the Doomsday Plane touched down in Bratislava, Slovakia. Gates had arrived for the NATO defense ministers’ meeting. Also in the city was McChrystal himself, there to brief the European allies on his ambitious counterinsurgency plan. The news from the conference would be an expression of “broad support” by the NATO officials for the McChrystal strategy-another endorsement of a plan that will require tens of thousands more troops. But, as Gates stood at a podium fielding questions, he kept his views as oblique as possible. “Drawing conclusions at this point is vastly premature. We’re looking at a full range of activities,” he said. Though he now appears firmly in support of a substantial troop increase, Gates has struggled to reach his own conclusion about Afghanistan. Perhaps that’s because he knows the complexity and unpredictability of the country all too well. In the late 1980s, Gates was instrumental in supplying arms and money to the anti-Soviet Afghan rebels. But, in another misjudgment of Soviet intentions, he never believed that Moscow would end its occupation. Even after Soviet leaders said in late 1987 that they would soon withdraw, Gates refused to believe it. He made a $25 bet with a colleague that it wouldn’t happen before 1989. When Gorbachev announced the withdrawal less than two months later, Gates coughed up the money. Though he wouldn’t discuss his advice to Obama with me, Gates has made several public comments that suggest a belief in a large troop presence. Speaking at a CNN roundtable discussion in early October, for instance, Gates warned against ceding large swaths of territory to the Taliban, as a counterterrorism strategy may entail. “There’s no question in my mind that, if the Taliban took large--took control of significant portions of Afghanistan, that that would be added space for Al Qaeda to strengthen itself,” Gates said. Such an outcome, he added, would be “hugely empowering” for Al Qaeda’s recruitment and fund-raising. Gates also seems less concerned than Biden and Obama’s political aides about faltering public support for the war. To be sure, he certainly appreciates the role of politics in foreign policy. Soon after he took over as defense secretary, he set out to lower “the political temperature” of the Iraq war debate. That was why Gates didn’t push for the reappointment of General Peter Pace as chairman of the Joint Chiefs of Staff; although Gates had nothing against the general, he was too tied to the fiasco in Iraq to be reconfirmed without an ugly political fight. “What he did was to say we couldn’t get him confirmed for a second two-year term without opening up discussions that would have been unhelpful to the national defense,” says Richard Kohn, a military historian at the University of North Carolina. Still, political considerations have their limits for Gates. He did, after all, support the Iraq surge at a time when it was immensely unpopular among Americans. The same appears to go for Afghanistan. “In any war that has lasted any time at all, those wars have never been particularly popular,” Gates says. “Even toward the end of World War II, by 1944, people were beginning to be war-weary and wondering why it was taking so long. A president basically has to decide what’s in the best interest of the country and then lead public opinion.” Both the Obama and Bush administrations, he said, have not done a good enough job of explaining to the American people why the United States is fighting in Afghanistan. One exception he cited: Barack Obama’s speech to the Veterans of Foreign Wars, in which he called Afghanistan “a war of necessity” to defeat Al Qaeda. It remains to be seen whether Obama will take Gates’s counsel on Afghanistan. But that’s not the only potential friction point. Gates’s caution about allowing gays to serve openly in the military--officially, he says the issue is under consideration--may be one reason why Obama has been dragging his feet on a pledge to end the military’s “don’t ask, don’t tell” policy. Gates also openly disagrees with Obama about the future of the Reliable Replacement Warhead program, a Bush-era effort to modernize the U.S. nuclear arsenal that was quashed by the Democratic Congress last year. Gates believes the program is vital to the continued viability of the U.S. nuclear deterrent--again putting him in opposition to Biden, who argues that development of new warheads would undercut Obama’s nonproliferation efforts and his call for a world free of nuclear weapons. Perhaps that’s an overstatement. Yet it is undeniable that Gates’s return to government has polished his image to an enviable shine. The hot-headed, scandal-tainted ideologue has been replaced by a pragmatic wise man shepherding a young president through wartime. But the war is not over. And, much as Gates contemplates returning to his quiet life in the Pacific Northwest--“every damn day,” he told me--he seems determined to leave Afghanistan in better shape than he found it. Doing that will require Gates to reflect on a past that he has, in other ways, left behind. Experience, he told me, “provides a perspective, or a prism, through which you look at the world. And, frankly, it can be both good and bad. Just like the Soviets in Afghanistan. Lots of lessons there. Lots of wrong lessons. You can get trapped by history.” Aboard a plane built for a cold war apocalypse that never came, it was clear that you can escape it, too.